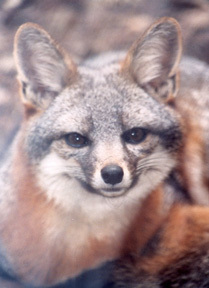 Across Santa Barbara, Ventura and Los Angeles Counties, school children play an important role in actively working to protect and save Channel Island foxes. Not only are these young people actively participating in efforts to protect an endangered species, they are becoming stakeholders in their local environment. 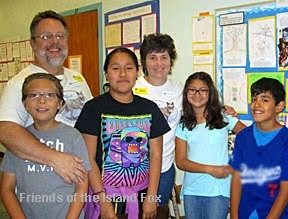 Island Fox Ambassadors are individuals, classes, groups, grades, or whole schools where the students have taken a special interest in island fox conservation and have participated in some way to help save endangered island foxes. 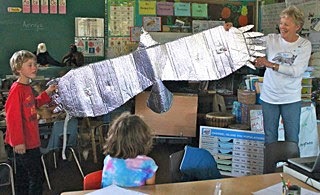 How big is a golden eagle? First, Friends of the Island Fox educators visit the school or group and provide a presentation on the island fox and why it is endangered. Programs. The young people then decide how they will contribute. Will they spread information to others, like their parents, families and friends? 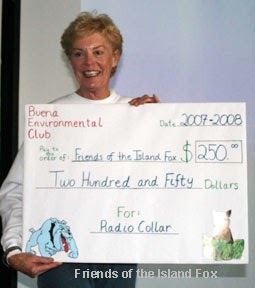 Will they raise funds for some aspect of island fox conservation? Will they engage in a service project on the islands? Teachers Kathleen Tomscha and Monica Shugart led the 4th grade teachers at Canalino Elementary to become Island Fox Ambassadors in 2009. They established a successful program selling hot chocolate and popcorn at the school's Family Movie Night and over the years the students and teachers of Canalino Elementary have funded - 2 radio collars and 13 vaccinations. This year, the 2nd grade students in four classes worked together and raised $88 to fund eight more island fox vaccinations. 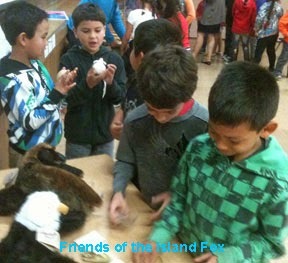 They were excited to look at island fox and bald eagle biofacts-including skull replicas, pelts and radio collars. Teacher Jan Silk has encouraged her 3rd and 4th grade students to be Ambassadors since she participated in a FIF teacher workshop in 2009. 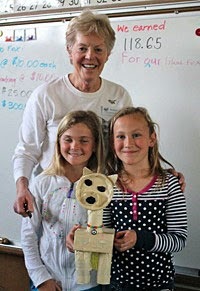 This year her students made a model island fox and collected donations for the opportunity to name the fox. When Pat Meyer visited the school she reached into the container and chose the ticket with the name. Much to everyone's delight, the name was "Pat." The students also are selling purses they have made. So far this year they have raised $120 for island fox health checks and vaccinations. The class will be visiting Santa Cruz Island in April and participating in two service projects: removal of non-native plants and collecting data on the types of trash enticing to island foxes in the campground and public areas. Over the years Jan's classes have also funded - a "Watch for Foxes" road sign and a radio collar. Lincoln Elementary currently working on a project.